It is bad enough that Annabel Craven has just moved into a creepy old mansion next to a cemetery and has to start a new school, but she has also destroyed her cell phone in the wash. This proves to be particularly troublesome when she comes across a weird guy in the cemetery demanding that she return what she took from him. A very confused Anna runs away, trips over a cell phone and decides to pocket it on her way to school. Things continue to get more confusing for Anna as it becomes clear that her newly found phone has very special capabilities, mainly--texting the dead. 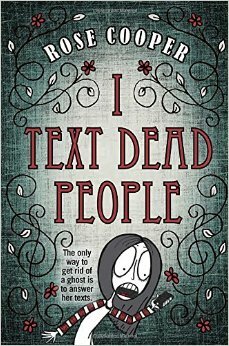 When one of Anna's new classmates is killed in a tragic accident, Anna must use her phone to help solve the mystery. I Text Dead People has a funny unique premise and Anna is an interesting protagonist. There are some expected and unexpected twists and the major mystery is wrapped up nicely. While some parts of the book did not quite add up as well as they should have, tweens will not care about minor flaws and will instead focus on enjoying Anna's entertaining character. They will be glad to know that more adventures are planned for Rose Cooper's Dead Series.